Mount Ossa viewed from Pineios river in Larissa. 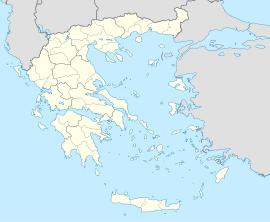 There are a number of highways including E75 and the main railway from Athens to Thessaloniki (Salonika) crossing through Thessaly. The region is directly linked to the rest of Europe through the International Airport of Central Greece located in Nea Anchialos a short distance from Larissa (about 60 km). Larissa lies on the river Pineios. The climate of Larissa is semi-arid in the cool version (Köppen: BSk) but it is close to a hot summer Mediterranean climate (Csa). The winter is fairly mild, and some snowstorms may occur. The summer is particularly hot, and temperatures of 40 °C (104 °F) may occur. Thunderstorms or heavy rain may cause agricultural damage. Larissa receives 413 mm (16 in) of rain per year. Silver drachma of Larissa (410-405 BC). Head of the nymph Larissa left, wearing pearl earring, her hair bound in sakkos / ΛΑΡΙΣΑ above, [IA] below (retrograde), bridled horse -symbol of the city- galloping right. The name Larissa (Λάρισα Lárīsa) is in origin a Pelasgian (pre-Greek) word for "fortress". There were many ancient Greek cities with this name. The name of Thessalian Larissa is first recorded in connection with the aristocratic Aleuadai family. It was also a polis (city-state). Larissa was a polis (city-state) during the Classical Era. Larissa is thought to be where the famous Greek physician Hippocrates and the famous philosopher Gorgias of Leontini died. Larissa was the birthplace of Meno, who thus became, along with Xenophon and a few others, one of the generals leading several thousands Greeks from various places, in the ill-fated expedition of 401 (retold in Xenophon's Anabasis) meant to help Cyrus the Younger, son of Darius II, king of Persia, overthrow his elder brother Artaxerxes II and take over the throne of Persia (Meno is featured in Plato's dialogue bearing his name, in which Socrates uses the example of "the way to Larissa" to help explain Meno the difference between true opinion and science (Meno, 97a–c); this "way to Larissa" might well be on the part of Socrates an attempt to call to Meno's mind a "way home", understood as the way toward one's true and "eternal" home reached only at death, that each man is supposed to seek in his life). The archaological excavations on Frourio Hill, with the Bezesten of Larissa in the background. In the 19th century, there was a small village in the outskirts of town very unusually inhabited by Africans from Sudan, a curious remnant of the forces collected by Ali Pasha. In the 19th century, the town produced leather, cotton, silk and tobacco. Fevers and agues were prevalent owing to bad drainage and the overflowing of the river; and the death rate was higher than the birth rate. [dubious – discuss] It was also renowned for the minarets of its mosques (four of which were still in use in the early part of the 20th century) and the Muslim burial grounds. Today Larissa is the fourth largest Greek city with many squares, taverns and cafes. It has three public hospitals with one being a military hospital. It hosts the Hellenic Air Force Headquarters and NATO Headquarters in Greece. It has a School of Medicine and a School of Biochemistry – Biotechnology and the third largest in the country Institute of Technology. It occupies the first place among Greek cities into green coverage rate per square-metre urban space and the first place with the highest percentance of bars-taverns-restaurants per capita in Greece. It also has two public libraries and five museums. 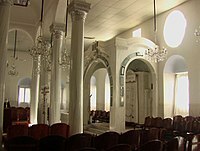 Inside the Jewish synagogue of Larissa. ^ "Updated Köppen-Geiger climate map of the world". people.eng.unimelb.edu.au. Retrieved 2019-01-18. ^ "Larissa Climate Normals 1961–1990". National Oceanic and Atmospheric Administration. Retrieved March 1, 2015. ^ Hippothous led the tribes of Pelasgian spearsmen, who dwelt in fertile Larissa- Hippothous, and Pylaeus of the race of Mars, two sons of the Pelasgian Lethus, son of Teutamus. ^ Curtis Runnels and Tjeerd H. van Andel. "The Lower and Middle Paleolithic of Thessaly, Greece" Journal of Field Archaeology 20.3 (Autumn 1993:299–317) summarises the survey carried out in June 1991. ^ "Henry George Liddell, Robert Scott, A Greek-English Lexicon". Perseus.tufts.edu. Retrieved 2009-07-08. ^ "The city and the plain around it were settled in prehistoric times, and its name must be early, but it is first mentioned in connection with the(Richard Stillwell, William L. MacDonald, Marian Holland McAllister, eds., The Princeton Encyclopedia of Classical Sites (Princeton University Press) 1976, 's.v. "Larissa, or Larisa, or Pelasgis, Thessaly"). ^ Mogens Herman Hansen & Thomas Heine Nielsen (2004). "Thessaly and Adjacent Regions". An inventory of archaic and classical poleis. New York: Oxford University Press. pp. 714–715. ISBN 0-19-814099-1. ^ Mogens Herman Hansen & Thomas Heine Nielsen (2004). "Thessaly and Adjacent Regions". An inventory of archaic and classical poleis. New York: Oxford University Press. pp. 695–697. ISBN 0-19-814099-1. ^ SUZANNE, Bernard F. "Larissa". plato-dialogues.org. ^ a b c d e f Kazhdan, Alexander (1991). "Larissa". In Kazhdan, Alexander (ed.). The Oxford Dictionary of Byzantium. Oxford and New York: Oxford University Press. p. 1180. ISBN 0-19-504652-8. ^ a b c d Savvides, A. (2002). "Yei Shehir". In Bearman, P. J.; Bianquis, Th. ; Bosworth, C. E.; van Donzel, E.; Heinrichs, W. P. (eds.). The Encyclopaedia of Islam, New Edition, Volume XI: W–Z. Leiden: E. J. Brill. p. 333. ISBN 90-04-12756-9. ^ Oriens Christianus II, 103–112. ^ Heinrich Gelzer, "Ungedruckte. . .Texte der Notitiae episcopatuum", Munich, 1900, 557. ^ Parthey, Hieroclis Synecdemus, Berlin, 1866, 120. ^ Gelzer, op. cit., 635. ^ "Rybnik Official Website — Twin Towns". City of Rybnik. Urząd Miasta Rybnika, ul. Bolesława Chrobrego 2, 44–200 Rybnik. Archived from the original on 2009-05-28. Retrieved 2008-11-01. "Larissa" . Encyclopædia Britannica. 16 (11th ed.). 1911. p. 217.